These slides have been designed to work in conjunction with the Stainless Steel Prep Table , Stainless Steel Camp Table or a Stainless Steel Prep Table w/ Basin and Under-Rack Table Latch to make taking a sturdy table along with you on your travels as simple and effortless as possible. A no-noise, secure storage solution designed specifically for the Stainless Steel Prep Table , Stainless Steel Camp Table or a Stainless Steel Prep Table w/ Basin . Bolts easily onto the Slimline II rack with supplied hardware. Slides can be mounted both parallel or perpendicular to the roof rack's slats allowing for access to the table from the side or rear of the vehicle. Made of 3CR12 Stainless Steel and finished in the same durable and corrosion resistant black powder coating as the Slimline II roof rack. Velcro loops are bonded to the slide's inner face to prevent scratching and vibration noise. 2 velcro loops per slide. Bolts easily onto the Slimline II with supplied hardware. Features a self locking mechanism when closed and push to release latching mechanism to open. In the closed position the latch can be securely locked using a small padlock or cable lock. Made from 3CR12 Stainless Steel, with a PVC Buffer to prevent vibration and noise. Powder coated in the same durable finish as the Slimline II rack. 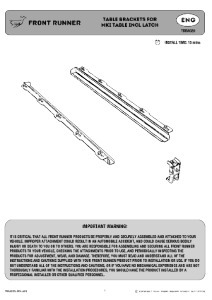 Includes installation hardware and fitting instructions. Have you had any luck installing these while the rack is still on a vehicle? It's absolutely possible (and done all the time) to install them once the rack is installed, but it will be a little more difficult to get everything square. Depending on how many other accessories are on your rack, it might be easier to remove the rack and install the slides on it upside-down before re-mounting the rack.